We, Peter and Rene, while on holiday in December 2014, fell in love with the beauty of Plettenberg Bay. This small friendly town with such a zest to preserve its history, surrounding nature, and wildlife, combined with so many activities, seemed just the place for us. 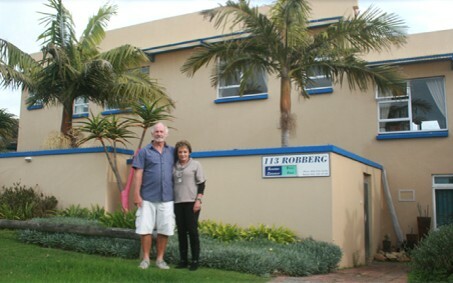 We stayed at 113 Robberg for 9 days. The owners at the time, ran the guest house superbly and went out of their way to make our stay memorable. On our return to Johannesburg we closed our business, sold our house, bought 113 Robberg and moved to Plettenberg Bay on 1 May 2015. We just love it and aim to give all the guests visiting 113 on Robberg, the same friendly, comfortable stay and make their visit to Plettenberg Bay memorable.